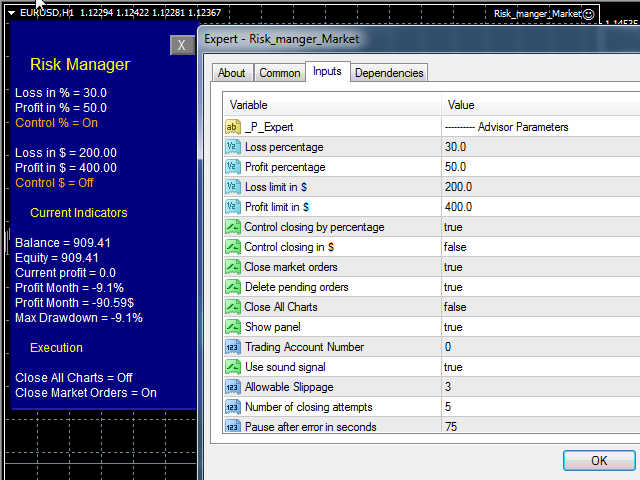 Advisor Risk Manager for MT4, a very important and in my opinion necessary program for each trader. With the help of this advisor you can control the overall risk on your trading account. The control can be carried out both in the marginal money equivalent of the maximum losses on the account, and in% interest. To work with the adviser, simply attach it to the chart of the currency pair and set the maximum permissible risk values ​​in the deposit currency or in% of the current balance. IMPORTANT! The Expert Advisor does not have the ability to test in the tester, since he only controls the risk of other transactions. Profit percentage - the size of the maximum profit for all open positions, after which the adviser will record the profit and close the order. Loss percentage - the size of the maximum loss for all open positions, after reaching which the adviser will fix the loss and close the order. Loss limit in $ - the limit size of the maximum profit in the currency of your deposit on the achievement of which the adviser will record the profit and close the orders. Profit limit in $ - the marginal amount of the maximum loss in the currency of your deposit on the achievement of which the adviser will fix the loss and close the order. 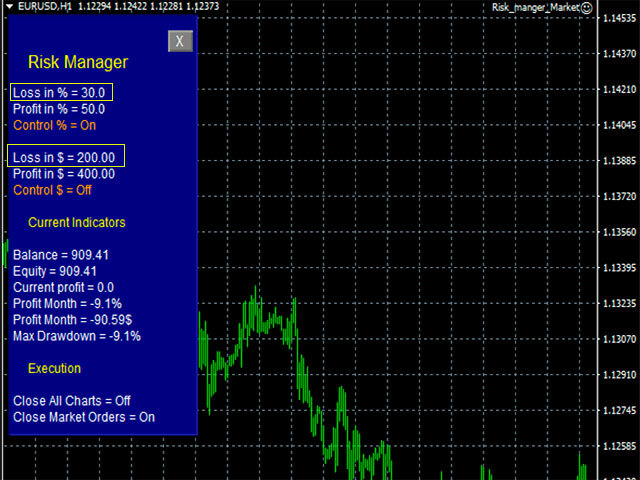 Control closing by percentage true / false - if true, the expert will control positions only by% balance change, controls the indicator Profit / Loss percentage. Control closing in $ true / false - if true is selected, the adviser will control the positions by the indicators Loss / Profit limit in $, respectively, the control will be carried out in the deposit currency. Close market orders true / false - if true is selected, orders are deleted if the risk is exceeded. Delete pending orders true / false - if true is selected, pending orders are deleted if the risk is exceeded. Close All Charts true / false - if true is selected, if you exceed the risk, all the charts in the terminal are closed, which indicates that it is time to pause the trade. Show panel true / false - show / hide the information panel. Trading Account Number - the account number on which the panel should work, if 0, then it works on any account. Use sound signal true / false - use sound notification of risk management exceeding. Allowable Slippage - allowable slippage. Number of closing attempts - the number of attempts to close positions. Pause after error in seconds - pause before a new attempt to close an order.